Guido gleefully points out that this song by Dominic Frisby is currently the second best selling album on Amazon music. Presumably he just means UK Amazon, but that is quite an achievement. I am getting automatically generated adverts for it. Yours for a quid! However please note before you serenade the street with your new purchase that it is a tad sweary. Honestly, there’s about seventeen million F*** O**s in it. It will not be news to regular readers of Samizdata that Mr Frisby is both a respected financial writer and an entertainer so good that he can make it despite being an open libertarian. Brian Micklethwait (repeatedly), Johnathan Pearce, Patrick Crozier and Rob Fisher have all posted about him. My finally joining the club to say he has a nice voice and a cool hat is something of an anti-climax. But he does have both of those things. And I get the feeling he’s a sporting bloke who will forgive me for being the millionth-and-first person to make irrelevant mention of this book just because it has the name “Frisby” in it. I also recommend the book, which I loved as a child and now I come to think about it as an adult has an almost John Galt vibe to it. Apparently Jeremy Corbyn has “stomped out” of a meeting of party leaders called by Theresa May to discuss the latest Brexit developments. The old boy left in high dudgeon when he saw that Chuka Umunna was there representing the Independent Group of MPs. Mr Corbyn didn’t think Mr Umunna should have been allowed in because TIG is not yet a proper party. Which it isn’t, but one cannot help finding it odd that after seeing fit to meet the IRA, Hezbollah and Hamas in the name of “dialogue” Mr Corbyn should cavil at a few minutes sharing the same air as a former member of the Labour party. No skin off my nose, tho’. It all makes sense if we assume that he still is the Brexiteer he was for forty years. A stopped clock is right twice a day. He wants No Deal but with May taking the blame if it goes wrong. Meanwhile Whatsername is due to address the nation. Overdue. You can look at some nice wood panelling on the YouTube livefeed here or the Reuters one here. Ooh, noises! I just heard noises! Update: Steps! She’s here… she’s boring. Not to mention tired of you. OK, some quite good sense on the damage to trust if Brexit stopped. Not prepared to delay Brexit past 30 June. Nothing new. Wha… what? She’s gone away. Was that it? The EU’s latest thinking is contained in a document circulated among ambassadors on Friday night. It confirms legal advice that the UK must hold European parliament elections in May if it wishes to remain beyond that point. It also contains the starkest warning yet of the threat to the EU’s legal order if this requirement isn’t met. In essence, the paper identifies a July 1 tripwire that would automatically terminate the UK’s membership and trigger a no-deal expulsion. Unless the UK had taken part in Euro elections or approved May’s deal by that time, both sides would be powerless to prevent it. That sharpens a three-way choice for MPs: back May’s deal this month and seek a short two-month extension, opt for a long-term extension and organise European elections in May or face a no-deal exit. This analysis piles yet more pressure on both Eurosceptic and pro-EU MPs to back May’s deal this month. That outcome is favoured by Michel Barnier, the EU’s chief negotiator. He fears that anything longer than a couple of months risks unravelling the 585-page withdrawal agreement his team spent two years working on. Hardline Brexiteer MPs will be pressed to approve the deal to avoid Euro elections and stop Brexit slipping from their grasp. Other MPs will come under pressure to back the deal early to avoid the tripwire. EU officials hope a parliamentary majority can be cobbled together – perhaps through a series of indicative votes – by late May. While some European leaders still toy with the idea of reversing Brexit in a second referendum, the risks of a rogue UK remaining in the EU after June and disrupting its agenda alarms others. The latest advice argues that the EU cannot impose restrictions on UK involvement in EU decision-making if it extends article 50. Officials also fear a prolonged UK membership could see dozens of British Eurosceptic MEPs descend on the European parliament. That has added to a broader exasperation among officials who want the UK to leave quickly. I went to the Mail for a simple explanation, but they didn’t seem to know. The UK’s own democratic arrangements are poor or not working well so why is the EU so bad? We need to regulate even the most basic items, such as how lightbulbs are made, because, er, fair trade. The costs of all this EU stuff are well worth it because it stopped a war for the past 70 years between the major continental powers. So stop going on about free trade, silly rules and farm subsidies. Look at the bigger picture. A few things: it is a big claim that the EU (or what used to be the EEC) has been the major reason for stopping Germany from invading France yet again after 1945. I would argue that the “glue” of the EU has had some positive impact, but surely, the fact that Germany was utterly destroyed in 1945, split in two, and that the Western powers faced the Soviets, and were protected under the NATO umbrella, was the key to why there wasn’t another continental war. And even if all the red tape, rule harmonisation, costly farm subsidies and all the other palaver was justified as a price worth paying on that basis, why would the UK, which wasn’t a defeated power and with a different history, want to subsume itself into a federal project? It does not follow at all. The case is not made. De Gaulle was also correct in his “non” to UK entry in the early 60s as he rightly feared that his Franco-German compact would be bent out of shape. As global trade expands and the world becomes “smaller” with the Internet and jet travel and containerisation, it doesn’t require ever larger, more elaborate bureaucracies of transnational states to be built. In fact, what things require is more, not less, devolution of power, more variety, and less one-size-fits-all thinking. Why should complexity require more centralisation, rather than less? The idea that we need single EU rules on how lightbulbs and other materials of the modern world are made is not justified on the basis of protecting “fairness”, and in fact all too often, such regulations are imposed and lobbied for by industry groups knowing that they raise barriers to entry against cheaper or different manufacturers, and reduce competition. Unless there are very clear-cut safety issues, I invariably smell a rat when people defend government bans on certain mechandise by talking about “fair trade”. It’s protectionism with a nice tie. My position is not an “anarchist” one. It is more in tune with a general classical liberal approach to business, government and diplomacy, and above all driven by scepticism about big projects to reshape very old institutions and national loyalties. The launch of the single currency was an exercise in hubris, the results of which are still with us. Take-home fact: Members of the European Parliament cannot, as far as I know, repeal a directive once it has become law. Nor can MEPs initiate a new law on their own, as an MP can. The MEPs are pale shadows of truly effective legislators and the democratic deficit in the EU is unsustainable. 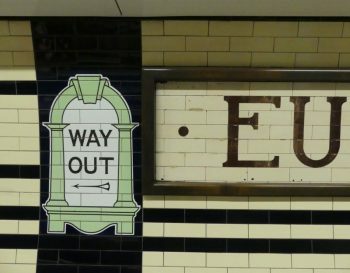 Today I was at Euston tube station, and found myself admiring the antique signage on one of the platforms, the Northern Line I think, done with painted tiles, rather than with a printing press or with electronic wizardry as is the way such things are done now. Way Out signs are not what once they were. So out came my camera. 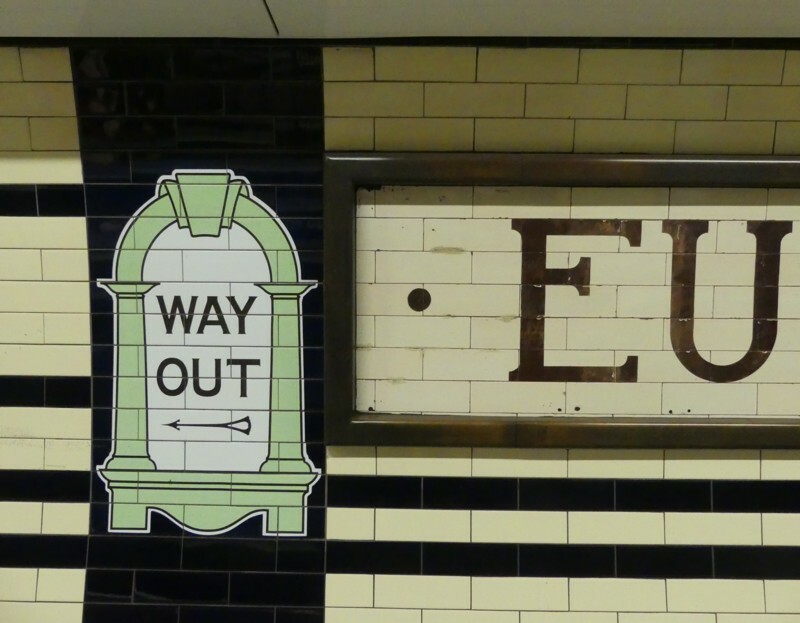 If only the way out of the EU was turning out to be as simple as exiting from Euston tube station. An article, since deleted, made nonsense claims about the treatment of EU migrants. When you try to find the article now you get a page that says it has been removed (rather amusingly, the related stories are eight other removed articles). The Guardian, unwilling to admit to its failures, claims that the piece was ‘taken down because it was found to have been based, in good faith, on outdated information’. This was after 16,000 people had shared it. What happens when a stab in the back myth isn’t a myth? This is partly why the first referendum was so important, where we saw surprisingly high rates of turnout in blue-collar seats. Because for the first time in years many of these voters felt that they could, finally, bring about change. I have one thing to add: if the establishment (which includes MPs of all parties) demonstrates that campaigning for forty years for a referendum and finally winning it does not work, it will not only be the populist Right who learn the lesson. The radical Left and the Irish, Scottish, Welsh and English Nationalists will also learn that the strategy of peacefully winning consent from voters is a mug’s game. A humbling must come to pass. From the beginning, Brexit created its own momentum. Once the question was asked – in or out? – all the grievances, justified or not, could be projected on it, with “in” being widely seen as a vote for the status quo. Within this frame, nothing else matters – not economic predictions, not warnings about medicines running out, nor threats of the need to stockpile foods. The remain campaign could not have done anything differently: it lost the moment the question was asked. And so, maybe, in the end, we will finally believe that immigration is necessary for an economy and an NHS to function, that the inequality between the south-east and the rest of Britain is unsustainable, that our political class is over-pedigreed and under-principled. We might even believe that other crises, such as climate change, are real, too. Maybe, in the end, the country outside Europe will find its stride by confronting its issues rather than blaming them on others, and forging its own way. But there is only one way to find out. What a shame Brexit is that path – but better to have a path than none at all. She is right about our political class being over-pedigreed and under-principled, right that unless Brexit happens the country will be torn apart by claim and counter-claim as to what would have happened, and right that a humbling must come to pass. Let us go forward together and find out whose. Those people who voted for you a couple of years ago thought they were electing Labour MPs. Given that things have turned out differently, and that your opposition to Brexit was a major motivation for your departure, should not each of you be confirming that you still have the people’s mandate by submitting to a People’s Vote, sorry, by-election?